Right now, I’ve got banana bread baking in the oven. But also right now, I’ve got a few more photos to share with you. More will come later today, as well! We were out of Palo Duro Canyon by 8:30 a.m. and immediately hit the road. Our final destination? Flagstaff, Ariz. That’s right: Our plan for Day 2 was to exit Texas, cross the entire state of New Mexico and end up in the middle of Arizona. The Sandia Mountains, as seen from I-40. These mountains border northern Albuquerque. The above photo was taken out of the car window as we drove down the interstate at the maximum legal speed. I should come out and say right now that I took quite a few out-of-the-car-window photos, and that quite a few ended up in the final edit. As ambitious as our drive was for Day 2, we planned to make two stops. 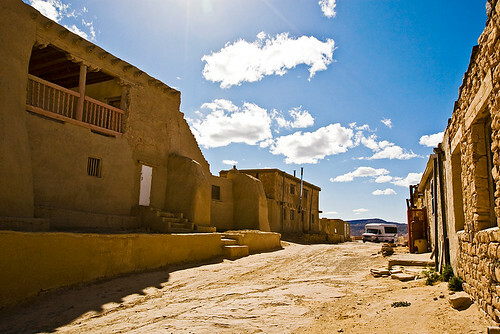 The first: Sky City on the Acoma Pueblo Native American reservation. The second: Petrified Forest National Park. We stopped at Sky City and took their tour, but we didn’t make it to Petrified Forest until after hours. Sky City is rightly named. 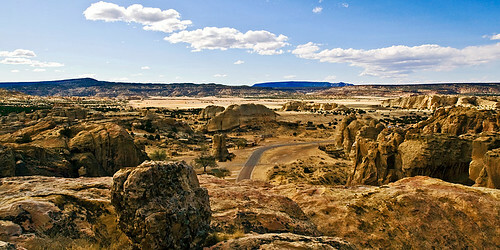 It’s an ancient pueblo village sitting atop a 367-foot mesa, about half an hour south of I-40. Built around the 1100s, the village remains inhabited. There is no running water or electricity. I should also add that photography is fairly restricted at Sky City. (See guidelines here.) Esten said the Acoma retain copyright over all photos taken at/of Sky City, but I’m not sure of that. In any case, the copyright status of all my photos at/of Sky City remains dubious. The view from the top of the mesa. At the end of the tour, we had the option of descending via the stairway carved into the side of the mesa. 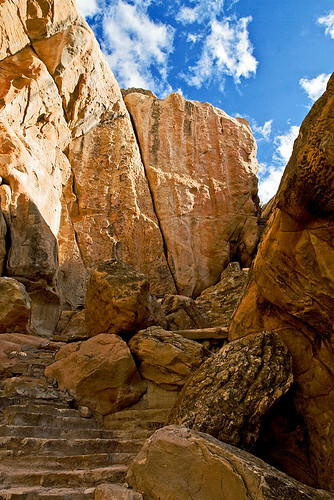 That’s how the Acoma originally used to access Sky City, until the road that is currently in use was built. Of course, Jeff, Esten and I took the stairway down instead of the tour bus. 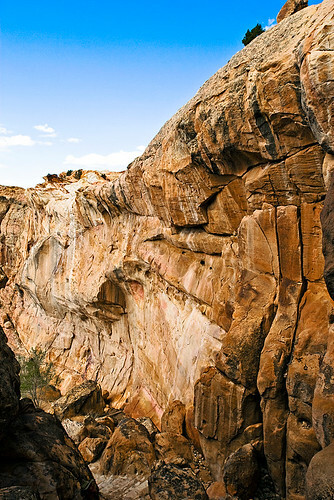 The rockface along which the stairway traverses down the mesa. It was a steep descent. 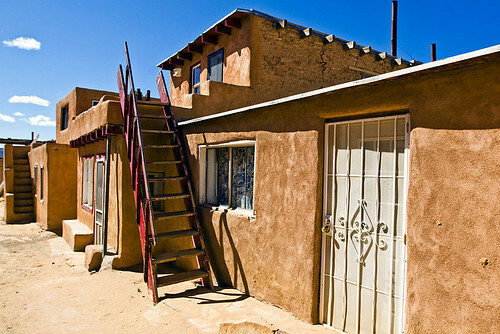 I can’t imagine going up that stairway on a regular basis — much less while hauling all the building supplies and other necessities for the village, as the Acoma used to do. The stairway. This is the least steep section. 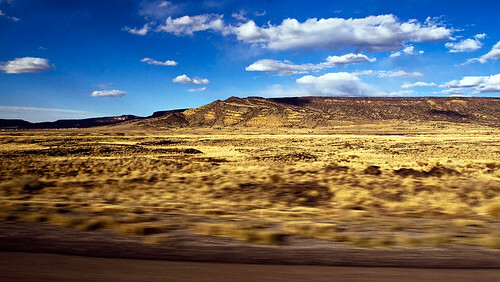 After leaving Sky City, we raced toward Arizona to try and get into Petrified Forest in time. We didn’t make it. But I hope someday I can retrace our steps and see that national park. Another out-of-the-car-window shot. 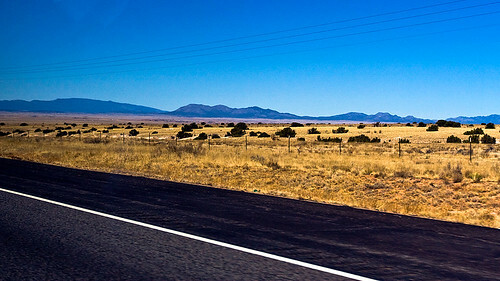 I'm pretty sure this is still New Mexico, since the sun is still shining. The sun was setting dramatically when we entered Arizona.